​Below are news articles from the latest newsletter (May 2018). If you need the newsletter in its entirety, please contact Newsletter Editor Teri Wilson. Program: Michelle Riley. "The Foodbank, Inc". The Foodbank has been in existence for forty years; it serves three counties (Montgomery, Greene, and Preble). The community vision is to ensure that food relief is available in our service area to all hungry people. The mission is to relieve hunger through the acquisition of food to hungry people in the Miami Valley. Hospitality Committee: Tea Cookies by Gourmet South; leader Denise Hedley. Tea Table Decor: Margie Newman; Pouring coffee / tea: Past Presidents Judy Holt (2009) and Marianne Shoemaker (2015). Cookie bakers from Gourmet South: Ruth Hoecker, Malou Hurst, Helen LeMay, and Margie Newman. Additional bakers are: Sue Merz, Marion Shingledecker, and Shirley Stallworth. From the CWC President (Dr. Shirley Stallworth): The end of the 2017-2018 CWC year is fast approaching. We have experienced blessings, ill-nesses and loss yet we still remain strong as an association. This strength is rooted in our faith in God, dedication of our membership to carry on the legacy of our founder Dr. Gertrude Felk-er, and a genuine desire to serve our outer communities. What a privilege it is to be part of this! The CWC Executive Committee, Standing Committee members and Study Groups have admirably worked together to accomplish many things -- thank you! Historically the month of May is named after the Greek goddess, Maia and the birth flower for this month is “The Lily of The Valley”. May is considered a spring month and with the unsea-sonable weather we have been having, I hope that it lives up to the name. May is also a won-derful month of celebration beginning with May Day (May 1). The origin of May Day is that on May 1, 1886, more than 300,000 workers in 13,000 businesses across the United States walked off their jobs in the first May Day. This celebration might mean little or nothing to most of us as we are classified as “retired” (LOL). Locally the Carillon Historical Park has several events planned in May: e.g. The Fleurs de Fete Festival - live music, wine tasting, and a silent auction on May 20. Memorial Day this year is celebrated on Monday May 28. To our members who may have lost loved ones who gave their lives while serving in the U. S. mili-tary, you have our deepest respect. - Obstacles and detours will inevitably alter our course, but we still get to choose each new di-rection to take. THERE IS ALWAYS A WAY TO GO FORWARD! The CWC Constitution was presented at the April luncheon; it will be brought forth for a vote at the May Luncheon. I you would like a copy, contact Jean Short, Parliamentarian, at 439-1353 or jbssud@gmail.com. CWC Board Meeting: The board meeting will be held on May 7 at 10:30 a.m. at the Dayton Woman's Club. May Newsletter Deadline: Tuesday, May 8 to Teri Wilson by either email or snail mail. Teri's contact information is in the yearbook. Yearbook changes: Please check the 2017 - 2018 yearbook. If you have changes that need to be made for the 2018 - 2019 Yearbook, please contact Sue White by the June Luncheon. (Check for addresses, phone numbers, and any study group information.) ALSO: Please see the current newsletter for several noted updates to the directory. We welcomed three new members at the April luncheon: Sarah Murphy, Deborah Barry, and Jan Vivanco. Please see the newsletter for mini-bios of these three ladies! June Livesay thanks everyone for all the best wishes! Willa Jean Smalley thanks Shirley Stallworth and the many CWC members who sent cards. ​Study Groups: Please refer to your yearbook for date, time and place, and additional information about each study group. If you would like to attend as a guest or join the group, please call the leader. Book Group — Leader: Malou Hurst. May 21 at 11:30. Coco's Bistro., 250 Warren St.
Arts and Crafts Group — Leaders: Sandy Mefford, Linda Parker. May 22 at 10:00. Program: Planning for 2018 - 2019. Lunch: The Dayton Woman's Club. Interior Design Group — Leader: Marsha Tolle. Program: Ethan Allen Visit., 821 Miamisburg-Centerville Rd. Lunch: The Chop House. Hostess: Marsha Tolle. Gourmet North Group -- Leader: Susan Buckles. May 10 at 12:15 pm. Hostess: Sue White Co-Hostesses: Terri Wilson and Donna Zobrist. Gourmet South Group -- Leader: Denise Hedley. May 3 at 12:30 pm. Hostess: Helen LeMay. Co-Hostesses: Joan Hardy, Malou Hurst, Jane Rininger. Book Review by Malou Hurst: “The Broken Girls” by Simone St. James is the perfect book for a dark and stormy night! A ghost, a few murders, and old and new mysteries! You won't want to put this story down! It begins in the 1950's in a run-down school for unwanted girls. Idlewild Hall is no haven for the troublesome girls who board there, but friendships blossom as do tales of Mary Hand, the local ghost. Then one of the girls disappears. In 2014, Fiona, a journalist, still mourns the murder of her elder sister 20 years ago. Her body was found at Idlewild Hall and now someone has purchased the property to renovate it and reopen a school. Fiona begins to investigate and the action begins! The story moves seamlessly from the 50's to the present. The characters are engaging, especially the four friends from the 50's. The ending is totally satisfying! ! Enjoy! Outreach for May: “To whom much is given, much is expected.” An upcoming opportunity to share our many blessings with others will take place at the May luncheon. The speaker will be from the Miami Valley Foodbank. We are asking you to bring some canned goods and/or seed packets to contribute to this mission that helps so many in our area deal with the problem of hunger. There will be labeled containers to accept your items. The CWC Outreach committee thanks you in advance for reaching out and helping others. 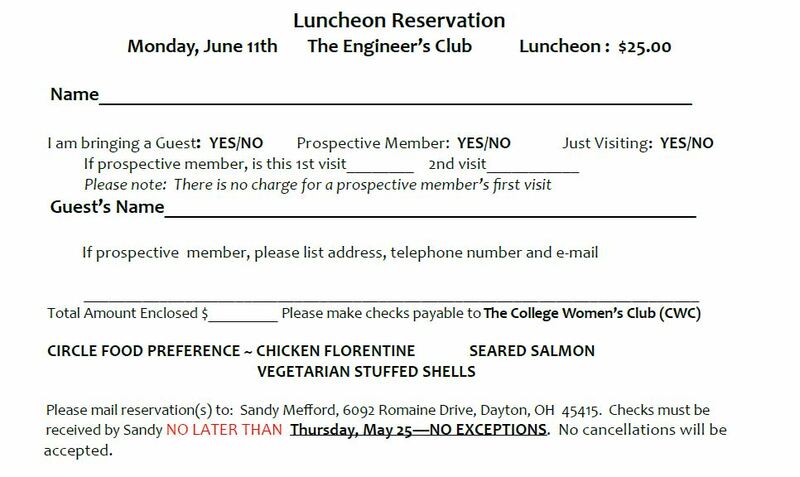 The May and June Luncheon Reservation forms for EACH of the next two luncheons is provided below. 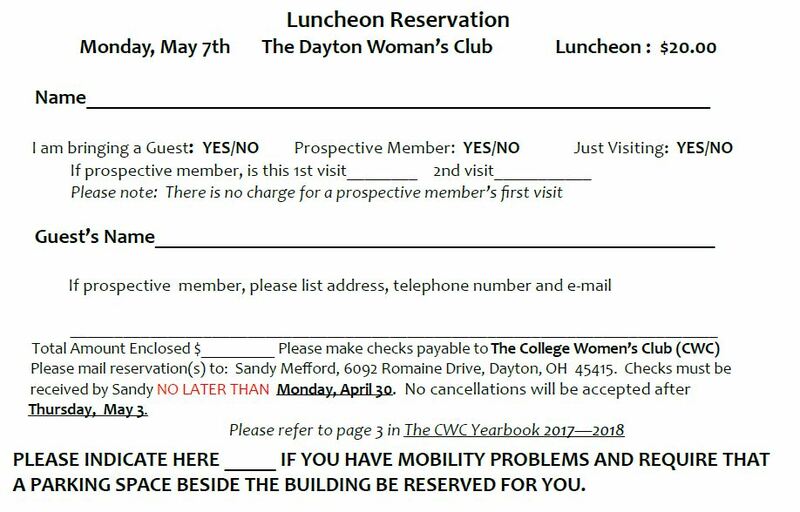 NOTE: The CWC May 2018 Luncheon is $20.00 (DUE April 30), and the June 2018 Luncheon is $25.00 (DUE May 15). NOTE: please indicate entree choice for June. Separate checks, please, but you may mail them in the same envelope to Sandy Mefford.